Heat, purify water, distill alcohol and make bioethanol - all this by using solar energy ! Alinda invest is dealer of Solarstill LLC in Brazil. No electricity, only renewable, solar energy. Solar Water Purifier that produces potable water from most surface or underground sources using renewable energy and destroying virus and bacteria. Solar Water Distiller for tap water. Save money and stop purchasing and transporting bottled drinking water, or replace costly membranes in competitor's equipment. Solar ethanol Distiller for biofuel or spirits distillation. Can distill ethanol fuel or spirits such as whisky, rum, vodka, bourbon, essential oils, water and others. 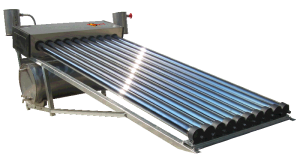 Solar Water Heater that is easy to install and maintain, self contained, no pumps required, suitable for hard water and all climates.